Trubbish in game: 2,146 Who? Important notice! Pokemon Trubbish is a fictional character of humans. Trubbish (Japanese: ????? Yabukuron) is a Poison-type Pokémon introduced in Generation V.
It evolves into Garbodor starting at level 36. Trubbish resembles a full, dark green garbage bag that with a knot at the top that acts like ears. 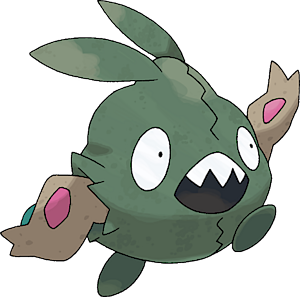 Trubbish has oval-shaped eyes and large triangular teeth that resemble broken glass. Its arms that look like trash spilling out of small tears in the bag with pink and blue objects protruding out of them. Its feet are dark green and stubby. This Pokémon was breed when a mixture of domestic and industrial waste underwent a chemical reaction of some sort. Trubbish emits noxious, burp-like gases which, when inhaled, will render the victim bedridden for a week. As evidenced in the anime, Trubbish's ear-like tufts stand straight up when startled, are lifted if happy, and lowered if it is feeling down. Furthermore, in the same episode, it is also explained that once Trubbish befriends a person, it will cease expelling foul odors. It prefers unsanitary places, such as garbage dumps. Trubbish appeared in Here Comes the Trubbish Squad! where a bunch of kindergartners befriended it. However their kindergarten teacher, Daniela, thought it would spread an awful stench through the school. In the end, Trubbish saved the kindergartners' lives, and was adopted by Daniela and the Kindergartners after finding out that Trubbish's stench fades when it's with people it trusts. A group of Trubbish appeared in Lost at the League!. A Trubbish appeared in a flashback in A Trip Down Memory Train!. 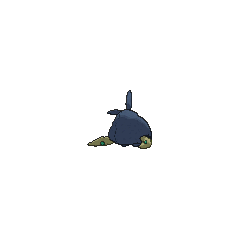 A Trubbish appeared in Clash of the Connoisseurs! in a fantasy. Three Trainers' Trubbish appeared in SM006. BW012 Trubbish Ash's Pokédex Trubbish, the Trash Bag Pokémon. 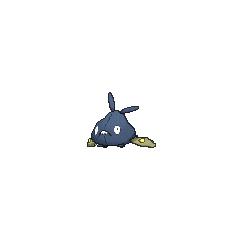 Trubbish prefer to live in dirty places like garbage dumps. It is said they were born when a chemical reaction occurred between an abandoned trash bag and industrial waste. Janitor Geoff owns a Trubbish that he used to battle Black. It used its terrible smell to prevent Black's Pokémon from getting close to it; Tep needed to cover his nose to defeat it. Inhaling the gas they belch will make you sleep for a week. They prefer unsanitary places. The combination of garbage bags and industrial waste caused the chemical reaction that breed this Pokémon. Wanting more garbage, they follow people who litter. They always belch poison gas. Unsanitary places are what they like best. They can be spotted in Alola, often with Grimer in hot pursuit. It gorges on trash until its stomach is full. Then it belches toxic gas. An unlucky whiff of gas will put a person in the hospital. Moves marked with a superscript game abbreviation can only be bred onto Trubbish in that game. Even though they are scared of the big eater, Munchlax, they still sort of like him. 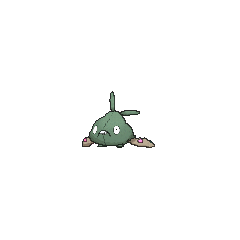 For other sprites and images, please see Trubbish images on the Bulbagarden Archives. 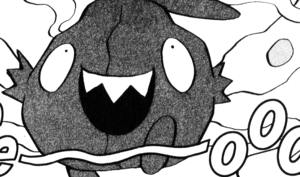 Trubbish was leaked internationally in the opening for Pokémon: Black & White. Trubbish shares similar traits to Grimer and Koffing. All three Pokémon are pure Poison-types with a single evolution and roughly the same base stat totals. 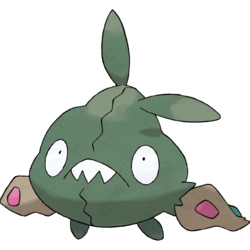 Physically, Trubbish is modeled after a plastic bag stuffed with garbage, its tied-off top somewhat resembling long, rabbit-like ears. This may draw from the fact that in both English and Japanese slang, a clump of lint and dirt can be called a "dust bunny". This is further evidenced by how the name of its evolved form is derived from "dust" as well. Trubbish is a combination of trash and rubbish. Yabukuron may be a combination of ?? yabuku (to tear) or ??? yabukeru (to get torn) and ? fukuro (bag) or ???? bukubuku (loose-fitting/baggy). Mandarin Chinese ??? Pòpòdài Possibly derived from the Japanese name. ? means "damaged" or "worn out". ? means "bag".